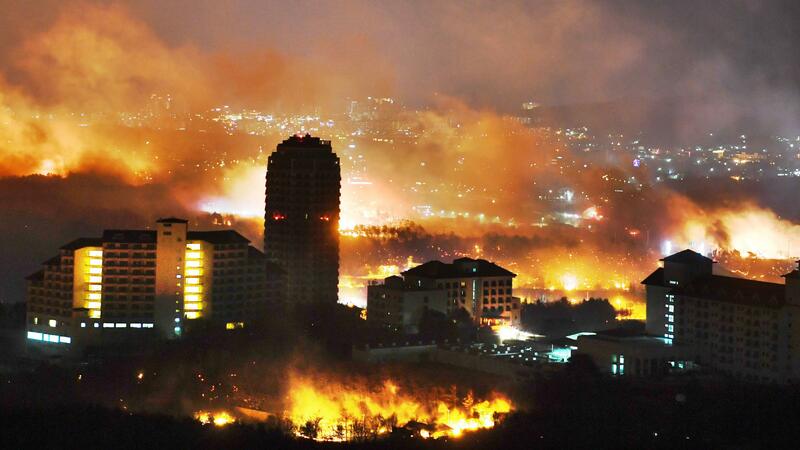 A forest fire is seen raging near buildings in Sokcho, South Korea. South Korea mobilized troops and helicopters to deal with the massive blaze that roared through forests and cities along the eastern coast. The main fire is now nearly under control according to Moon, who visited the area Friday. Taking note of the hundreds of homes and buildings that have reportedly been destroyed, Moon urged government officials to "take extra care of displaced victims who — after having lost their homes in an instant — may now find time to catch their breath." The fire started early Thursday night in Goseong, a mountainous county just below the border with North Korea. "Moon's office said he would cooperate with North Korea on fighting the fire if it spread northward," NPR's Anthony Kuhn reports from Seoul. "But as it happened, the winds were blowing to the south." Firefighters work to put out flames from a wildfire in Sokcho, South Korea. The fire struck an area where a line of mountains bracket towns and cities along the coast — including Gangneung, the city that hosted events in last year's Winter Olympics. Among those caught off guard was Kim Tae-gi, 69, a volunteer fire lookout who received a text alert warning of imminent danger less than an hour after he finished his shift. Kim told the Herald that he immediately rushed to his home in the town of Toseong-myeon to make sure his dog was safe. "I escaped from the burning house right after I brought out my dog. I couldn't bring anything else with me, and all I have now are these clothes that I was wearing last night. I had to watch my house burn from my car," Kim said. As he spoke, he was holding his dog, the newspaper says. 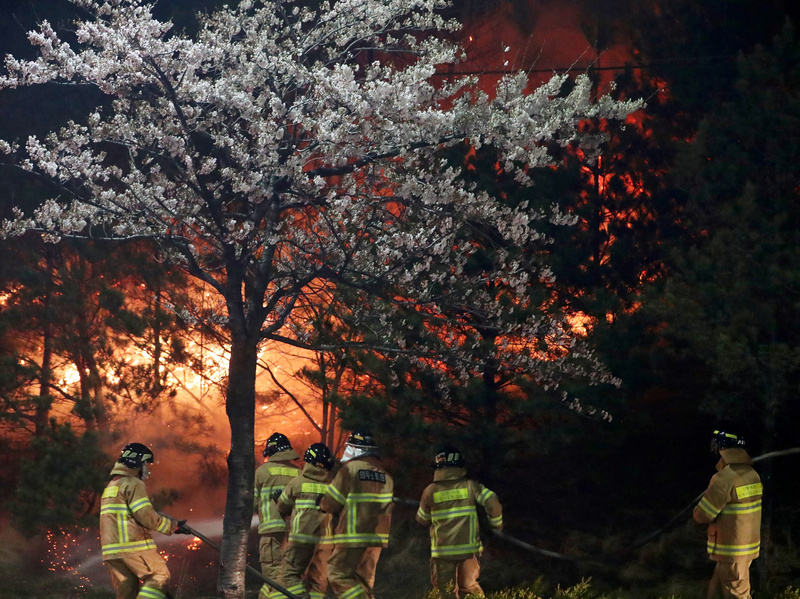 With firefighters gaining control of the main blaze, many of the residents who spent last night in temporary shelters had started to return home by early evening Friday local time, according to Arirang News. But smaller fires were still burning elsewhere. 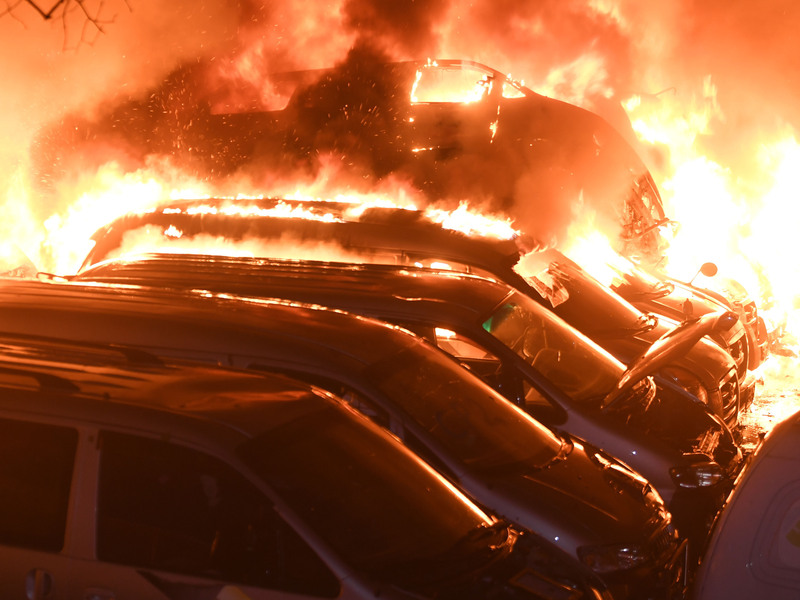 Vehicles burn in Sokcho, South Korea, part of the damage from the worst wildfires the country has seen in years. Overall, the flames burned some 529 hectares (1,307 acres), the Yonhap news agency reports, citing fire control officials in Gangwon. The firefighting effort includes more than 13,000 rescue workers, according to Yonhap, which adds that 16,500 military troops are also part of the push to bring the fire under control.